Beauty rocks! There ain’t a doubt about it, but if you wish to project your beauty salons or spa as next hottest happening place (after an erupted volcano!) in the city, then it’s worth of investing in some beauty and spa salon magnets. Until few years back many of these beauty hotspots thrived on WOMM (Word- of-mouth-marketing) and they rarely stepped out of their comfort zones to find new customers. Today, the scene is slowly changing; all of a sudden everyone wants to look good and crisp at all times. Most of us are always ready to head to some beauty hotspot, where we can expect a cosmetic makeover from a “plain Jane to a Cinderella” or “Old Jack to a towering Olympus” within few hours of tweezing and tweaking from a beauty expert. It is here the real game begins, these beauty hotspots cannot afford to miss that spur of a moment when a person makes up his mind to look good at any cost. They can always gather those defying moments in their stride by offering beauty and spa magnets to their customers. Hair Care Magnets – They make an effective choice for promotion if you own a hair salon or a trichology clinic. A promotional magnet recounting your services and contact information will easily show up against a refrigerator door. It will definitely strike within a person who wishes to trim down his stresses or try out some new hairstyle or wishes to seek treatment for hair fall. Beauty Salon Magnets – We have often heard the term “sky is a limit” to describe things which offer large canvas and packs immense personalization potential. Here you can beautify it to sound “Sky ain’t a limit when it comes to beauty and salon magnets” because it offers countless personalization options for people involved in beauty and health care business. A yummy looking lass strutting out your contact details, services or availability will never go a waste and a person will be dragged to the salon by merely looking at it. Back Spa Massage Magnets – Back spa massage is often seen as a luxury treatment because it soothes your senses and boosts your spirits. Today, many beauty spas and salons offer back spa massage under specialized packages to attract more customers. Spa and salon owners offering this service can choose to highlight it by utilizing back spa and massage magnets for promotions. A shiver of relaxation will run down their spines, whenever a person see a well-designed back spa massage magnet over their refrigerator doors. 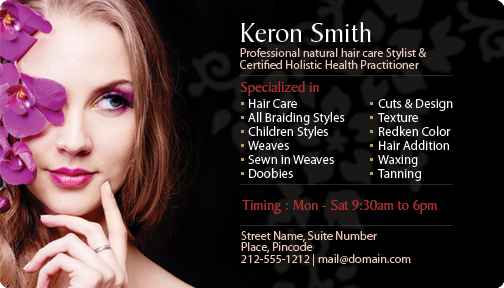 Beauty Salon Business Card Magnets – For a newbie, it may appear as a magnetic transformation from regular paper business cards, but in fact it offers a larger canvas to beautify your credentials. You can choose to get it personalized with eye catching graphics, contact details or brief introduction about services offered. Revisiting the thoughts “Sky aint a limit if you are finding ways to sell your beauty business” and it can be truly experimented or experienced by introducing beauty and spa magnets on marketing radar.